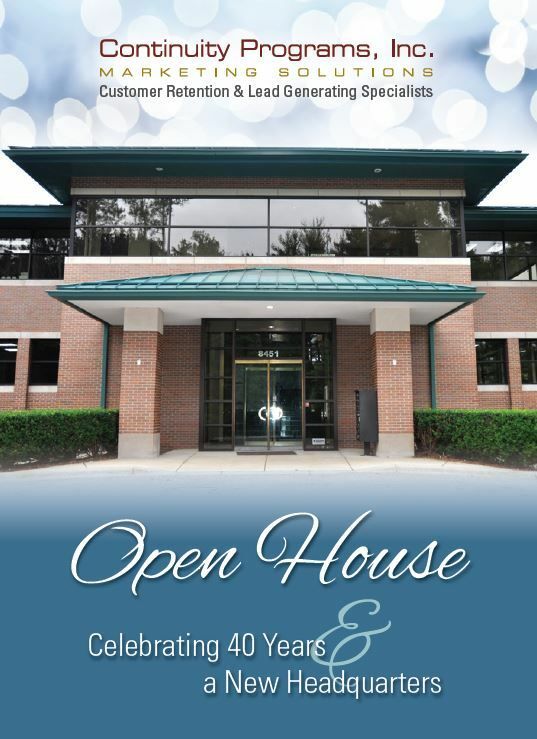 The open house will be from 3 to 8 p.m. on Thursday, October 24, at 8451 Boulder Court in Walled Lake, Michigan. Continuity Programs, its employees, and its managers have invited clients and prospects to join them in honoring the company’s 40th year in business as a marketing solutions provider to clients throughout the United States and Canada. The company will offer tours of the new facility. Continuity Programs team members will be on hand to meet and talk about the company, its history and its mission. Attendees will also be able to learn about the company’s new equipment and planned technological enhancements that will make Continuity Programs even more effective and valuable to its future clients. Persons interested in attending the Continuity Programs open house should register in advance at the online event registration page. Please call 800-521-0026 for more information or assistance. Registrations are requested by October 10, 2013. Continuity Programs is a premier provider of personalized customer retention and lead generation marketing programs. Founded in 1973, Continuity Programs pioneered some of the most effective customer retention, lead generation and customer loyalty techniques used in business today. The company designs and implements programs for acquiring and keeping customers and is known for its customized turnkey solutions that meet the needs of businesses of any size. Contact Continuity Programs today for more information on our professional, client-focused marketing solutions, or visit our website to find out more about our company and what we can do to help you expand your business and grow your profits.